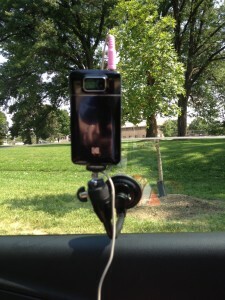 #AgNerd Recommends: Mobile Monopod for Vlogging - JP loves LIFE! 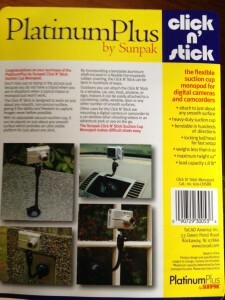 It is sort of a monopod built on a suction cup. A real agnerd rush came over me! I’m still not sure what to call it unless I use the product’s trade name… the click n stick… but I immediately knew what it would do — help agnerds like me take mobile video that would be far more stable! 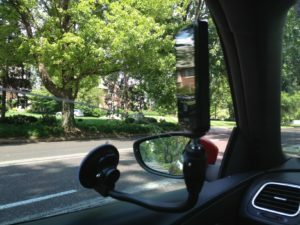 No more trying to hold the camera while driving a tractor! Seems to me a few farmers I know could use this — especially if they don’t have autosteer. 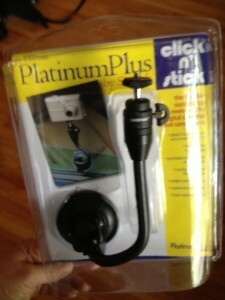 Note the product I bought is called Platinum Plus Click n’ Stick by SunPak. I got it at my local Best Buy for about $20 but you can get it online too. I think using an external mic can really help make a difference. This is a small clip on one I got years ago to use with my computer. I think it cost me about $10. The only thing I need to do is plug it in, make the selection for microphone and clip it to my clothes and I get better audio! It was really useful and with a fairly lightweight camera like most flip-style video cameras, would easily be perched up on the monopod for a long time without problem. Here’s some video I took while using it. 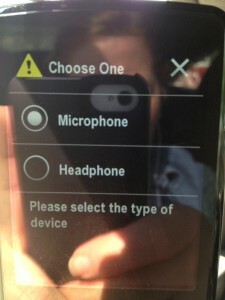 Capture on the go video, especially in tight places. I could stick this to the French doors on my deck and capture some serious grilling action or to the the shelf next to the grill to catch a bit of closeup action! I have granite countertops in the kitchen, the monopod could pop on that, the side of the refrigerator or any other smooth surface! I could have sucked it to the glass at the zoo and captured monkeys & snakes moving around! And while I don’t mean to imply they are at all similar, you could use it at a hospital nursery if your new arrival needs a little time under special care. Since its so inobtrusive, I think people may be willing to video occasions where we typically don’t want a lot of people or movement. especially if you have a remote! Thinking potentially an on-stage camera for a dance recital or aimed toward the congregation at a wedding, etc. Have fun and let your imagination run wild! As you can see from the list above, I have already thought about LOTS of uses! If you are going to be “in the shot” aim the camera with a marker of some sort & then check to see how it looks by shooting a test & watching it. For most things you can do a second take if your head is cut off or something! I admit I’d be careful where I’d place my camera — gotta remember dust, heat, steam, etc. are not good for cameras! Watch putting it in places where if the suction is lost, the fall will break the camera unless you are willing to lose the camera. When shooting through glass (like the windshield or at the zoo), check a few angles to see how you can eliminate or at least reduce glare. What tools & tips do you have for shooting video for your blog? « Just Farmers » Any Benefits from a Change in Perspective? I was hoping to use it with my iphone. I am not carrying around my video recorder much anymore. That was my deal…. I kept coming up with other ideas on using it! And I already have the flip cam so why not! That really does look cool…. I could see that coming in handy for skyping from my phone. Glad you liked it…. I really am sold! This has my name written all over it. Thanks for sharing JP! Awesome on the truck window dude!